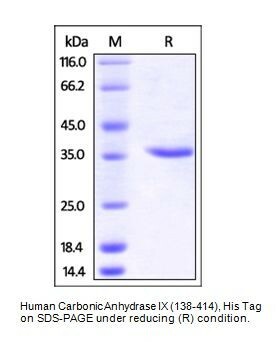 Human CellExp™ Carbonic Anhydrase IX / CA9, Human Recombinant | P1336 | BioVision, Inc.
A zinc metalloenzyme serving as a novel specific biomarker for a cervical neoplasia. Carbonic anhydrases (CAs) are a large family of zinc metalloenzymes. CAs form a family of enzymes that catalyze the rapid interconversion of carbon dioxide and water to bicarbonate and protons (or vice versa), a reversible reaction that occurs rather slowly in the absence of a catalyst. One of the functions of the enzyme in animals is to interconvert carbon dioxide and bicarbonate to maintain acid-base balance in blood and other tissues, and to help transport carbon dioxide out of tissues. The active site of most carbonic anhydrases contains a zinc ion. There are at least five distinct CA families (α, β, γ, δ and ε). Carbonic anhydrase 9 (CA9 / CAIX), also known as Membrane antigen MN (MN), Renal cell carcinoma-associated antigen G250, which belongs to the alpha-carbonic anhydrase family. CA9 / CAIX with an optimal activity at pH 6.49. Reversible hydration of carbon dioxide. CA IX participates in pH regulation. 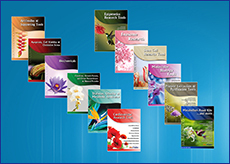 CA9 may be involved in the control of cell proliferation and transformation. CA-IX appears to be a novel specific biomarker for a cervical neoplasia.